B: Bruce Hall: What Was He Thinking Again? Bruce Hall: What Was He Thinking Again? This is part two in a three part series with Portland photographer Bruce Hall. 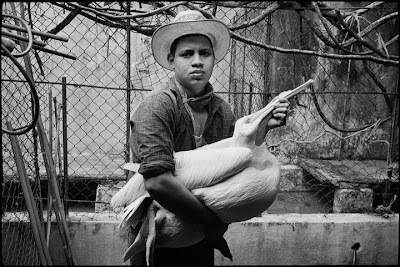 The following images are from Bruce's longterm photographic study of Mexico. "This one is from Carnaval in Vera Cruz, Mexico last year. I was walking back to my hotel along the route of one of the many parades when I saw these dancers taking a break. Most everyone was drunk or in the process of getting that way, so it was an atypical scene within the larger context. It struck me as a sweet moment of human bonding in the midst of the chaos." 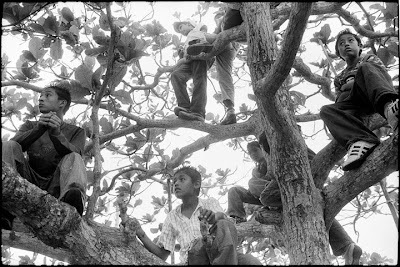 "I rented an apartment in Oaxaca a few blocks from where I made this photograph. 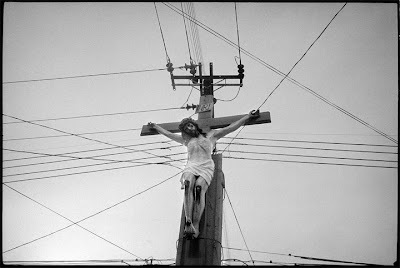 I walked past it almost every day and was immediately taken by the way at a certain angle it looked as if the telephone wires were emanating from Christ. I shot it with color and black and white film and liked the pictures quite a lot but it wasn't until I was there a year or so later that I made this picture. I was with two other photographers at that time and to my surprise neither of them seemed particularly interested." "This guy is one of a group of poor, young men in Vera Cruz who dive into the polluted harbor after coins that tourists throw in. They are there most days when the weather permits, and as far as I can tell it's how they get by. I shot mostly color film of them on two or three separate occasions. One of my favorite color shots from all my trips to Mexico is from that time. There was a break in the action and I asked this guy, who seemed to be the oldest and a bit of a leader, if I could shoot some pictures of just him. He was reluctant, but I gave him 20 pesos and he seemed ok with it then. 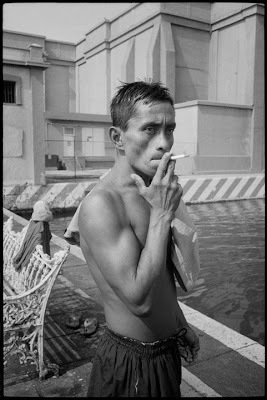 He sort of ignored me as I photographed him smoking his cigarette." "This is from Tlacotalpan, a small town about an hour and a half south of Vera Cruz. They have a festival there every year in February to celebrate their patron saint and regional music. Also it's an excuse to drink and have a big fiesta. 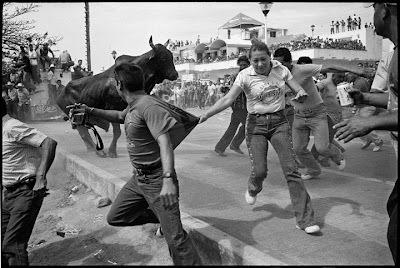 On this day they were running six 1500lb Brahman bulls through the streets as they do every year. They first swim them across the river one at a time guiding them to the sand ramp they've built under this tree, which allows the bulls to come up into a street lined with thousands of drunken people. These kids were some of the smart ones who had placed themselves out of harm's way." "Here one of the bulls is just up from the water and really pissed off. I can't adequately describe the feeling of seeing this thing rise up out of the river and charge the crowd. It had an almost apocalyptic feeling. I was running for my life and hoping not to end up face down picking my teeth up off of the pavement. I had a slight wide angle lens and was shooting at arms length. Last year two people were killed. Deirdre, who was with me on this trip, photographed from the second floor of a building one of the guys who died in the moment before his demise. He had dropped his can of beer and turned around to pick it up as the bull charged. The bulls are not intenionally harmed during this event and many people put water in front of their homes for the bulls to drink. Any kind of violent behavior toward the bulls is not tolerated." "This is from a family's house in Tlacotalpan. They save and rehab injured animals and have converted part of their home into a museum open to the public. I asked this kid if I could photograph him and he picked up this white pelican which had been caught in a fishing net years before to pose for a picture. I shot a number of frames. This one is my favorite. I made a nice 16X20 print and took it to him last year when I returned." Wonderful, tough, unblinking. Better than the first set (LA pix) but not sure why. Would be interested in seeing color work too. Probably because it's more focused and the photographer seems more certain as to what he wants to accomplish and how. Bruce Hall: What Was He Thinking?